Fukumi Shimura’s kimonos are made of textiles woven of yarn dyed with natural dyes. Fukumi Shimura is one of Japan’s premier textile artists, who is especially known for her use of natural dyes that create different colors depending on the season and environments the plants for the dyes were harvested. 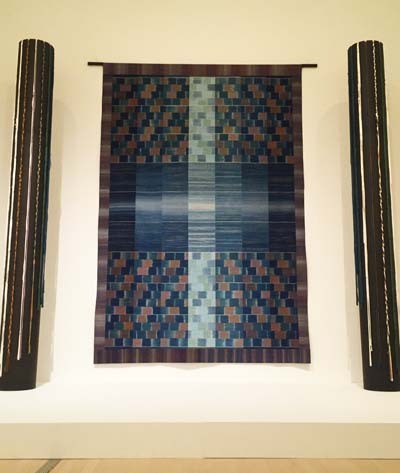 Shimura’s textiles are all one of a kind. She was born in Shiga prefecture in 1924 and started her career with textiles and dyeing at the age of 31 following in the footsteps of her mother. She weaves kimono fabric from threads colored with natural dyes in her workshop in Kyoto where she has worked over 60 years. The Japanese government designated her a “living national treasure” in 1990. 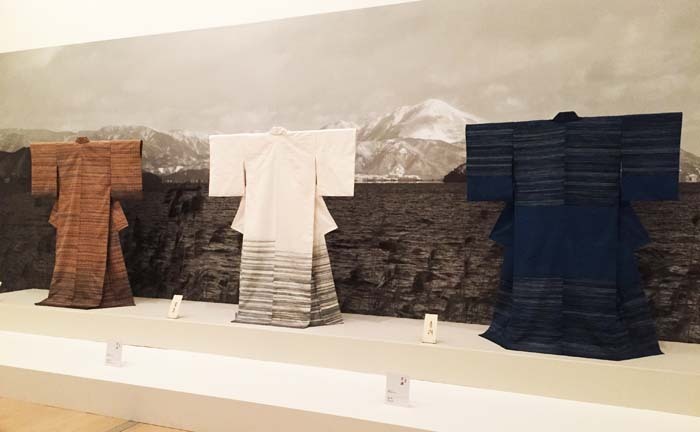 A collection of kimonos and other textile products created by Shimura are no on exhibition in Okinawa Prefectural Museum & Art Museum in Naha through May 29th. The museum is open from Tuesday through Thursday, and Sunday from 09:00 to 18:00. On Fridays and Saturdays the museum is open until 20:00. The last entry is 30 minutes before closing each day. The museum is closed on Mondays. Admission is ¥1,200 for adults at door or ¥960 in advance. University and high school student tickets are ¥800 at door and ¥640 in advance, and ¥600 at door and ¥480 in advance for elementary and junior high school students. Advance tickets are sold at FamilyMart (E-plus), Lawson (L-code: 81961), and at Ryubo Service Counter. Japan Update has four pairs of free tickets to the Fukumi Shiroma exhibition to raffle away among our readers. To participate, go to JU facebook page and send a message. Saturday May 21st is the International Museum Day, and admission to the museum is free, except for special and planned exhibitions. Free events on May 21 at the Okinawa Prefectural Museum & Art Museum include a Museum backyard tour. Usually people are not allowed to go to the museum’s working areas, but on May 21st the first 12 people to apply for the our can get an insider’s view of the facility from 14:00 to 15:00. Reservations are accepted at the museum’s general information counter. The museum also has four 30-minute workshops for persons from age 5 to adults. The workshops are titled “Let’s Make a Paper Toy,” and include 10:00 Windmill, 10:30 Horse, 11:00 Starball and 11:30 Habu. Children under the age of 9 have to be in the company of a parent or adult guardian. The workshops are limited to the first 40 people, 10 people in each workshop, For reservations, call or visit the museum’s Fureai Experience Room from 09:00. Admission is ¥100 that covers the materials, and must be paid at the entrance hall on the first floor.